Posted on 9, April 2019 by EuropaWire PR Editors | This entry was posted in Financial, France, Insurance, Internet & Online, Investment, News, Technology and tagged Accenture, Capgemini, Cognizant, consulting, digital services, digital transformation, Everest Group, HCL Technologies, Infosys, insurers, life insurance, PEAK Matrix, pensions, Pensions Insurance, Ronak Doshi, Shane Cassidy, TCS. Bookmark the permalink. PARIS, 9-Apr-2019 — /EuropaWire/ — Everest Group’s inaugural Life & Pensions (L&P) Digital Services PEAK MatrixTM sees Capgemini among the leaders. Capgemini’s ability to gain global insights through its consulting heritage along with its robust digital services, and partnerships with core product vendors have been acknowledged in the report. According to Everest Group’s Practice Director Ronak Doshi things like capabilities across multiple digital technology stacks, wide partnership ecosystem and established credentials to support L&P insurers have been found key for naming Capgemini a Leader in Life & Pensions digital services. Capgemini’s MD for Insurance Shane Cassidy thinks that making an impact in the L&P sector is all about digital transformation through the right technologies. Everest Group’s report has analyzed the capabilities of 19 service providers through an objective, data-driven, and comparative assessment based on their absolute market success and delivery capability. The other leaders, aside Capgemini, are as follows: TCS, Cognizant, Accenture, Infosys and HCL Technologies. The PEAK Matrix by Everest Group is a framework aimed at assessing the relative market success and overall capability of service providers. Everest Group positions service providers on the PEAK Matrix based on evaluation across two key dimensions: market impact measured by the market adoption, portfolio mix, and value delivered, and vision & capability measured by vision and strategy, delivery footprint, innovation and investments, and scope of services offered. 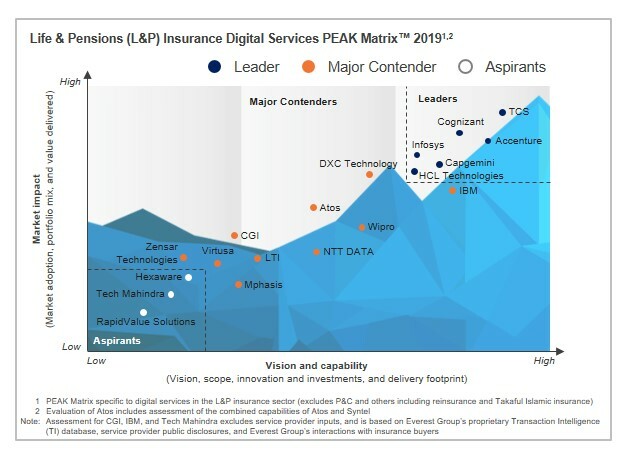 The full report called “Life & Pensions (L&P) Insurance Digital Services PEAK MatrixTM 2019 – Leapfrogging the Digital Transformation Stage” can be found over here.